With Virtual Machine Manager (VMM), you can easily connect virtual machines to a network that serves a particular function in your environment, for example, the “Backend,” “Frontend,” or “Backup” network. To do this, you associate IP subnets and, if needed, virtual local area networks (VLANs) together into named units called logical networks. You can design your logical networks to fit your environment. For more information about logical networks and how they work with other network configuration options in VMM, see Configuring Logical Networking in VMM Overview. VMM does not automatically create port groups on VMware ESX hosts. Therefore, in order for logical networks to work correctly for managed ESX hosts, you must use VMware vCenter Server to configure port groups with the necessary VLANs that correspond to the network sites. Account requirements To complete this procedure, you must be a member of the Administrator or the Delegated Administrator user role. Delegated administrators can only associate a logical network to host groups that are included in their administrative scope. In the Fabric pane, expand Networking, and then click Logical Networks. On the Home tab, in the Create group, click Create Logical Network. The Create Logical Network Wizard opens. Enter a name and optional description for the logical network. For example, enter the name BACKEND, with the description Corporate network. Use for internal servers such as application and database servers. If you have System Center 2012 SP1 or System Center 2012 R2, select check boxes as appropriate by using the table that follows. Otherwise, skip to the next numbered step in this procedure. Select one or more check boxes based on how you intend to use the VM networks that will be configured on top of this logical network. The following table provides guidelines. For additional descriptions of the ways in which you can use VM networks, see Common Scenarios for Networking in System Center 2012 SP1 and System Center 2012 R2 and Configuring VM Networks and Gateways in VMM. Hyper-V network virtualization: multiple VM networks with isolation Select Allow new VM networks created on this logical network to use network virtualization. Select One connected network and then select Allow new VM networks created on this logical network to use network virtualization. VLAN-based configuration: manage VLANs that have been created for network isolation within the physical network Select Network sites within this logical network are not connected. For information about additional steps for this configuration, see “VLAN-based configuration” in the list in Configuring VM Networks and Gateways in VMM. In most cases, select VLAN-based independent networks. However, if you are using private VLAN technology, select Private VLAN (PVLAN) networks. For information about additional steps for this configuration, see “VLAN-based configuration” in the list in Configuring VM Networks and Gateways in VMM. One VM network that gives direct access to the logical network: no isolation If this logical network will support network virtualization (in addition to having a VM network that gives direct access to the logical network), select the check box to allow network virtualization. If this logical network will not use network virtualization at all, leave all check boxes cleared. Select One connected network and select Create a VM network with the same name to allow virtual machines to access this logical network directly. If this logical network will also support network virtualization, select the check box to allow network virtualization. If you select One connected network but you do not create the VM network now, you will still be able to create the VM network later. External networks: use VMM in coordination with a virtual switch extension, network manager, or vendor network-management console Do not create the logical network manually from within VMM. Instead, follow the steps in How to Add a Virtual Switch Extension Manager in System Center 2012 SP1. The logical network settings will be imported from the database in the vendor network-management console (also known as the management console for a forwarding extension). Follow the steps in How to Add a Virtual Switch Extension or Network Manager in System Center 2012 R2, and be sure to review the capabilities of your virtual switch extension or network manager. You might be able to configure your logical networks in VMM and then export the settings to the virtual switch extension or network manager. In any case, after you add a virtual switch extension or network manager, logical network settings configured in it will be imported into VMM. On the Network Site page, take the following steps. For guidelines for configuring network sites, see “Network sites” in Configuring Logical Networking in VMM Overview. If you do not need to configure network sites, on the Network Site page, click Next, and then click Finish to complete the wizard. To create a network site, click Add. VMM automatically generates a site name that consists of the logical network name, followed by an underscore and a number. Review the network site name and ensure that it is no longer than 64 characters. To change the default name, in the Network site name box, enter a new name for the network site. For example, enter the name BACKEND - Seattle. Under Host groups that can use this network site, select the check box next to each host group to which you want to make the logical network available. For example, to make the BACKEND logical network available to the Seattle host group and all its child host groups, select the check box next to Seattle. Under Associated VLANs and IP subnets, enter the VLANs and IP subnets that you want to assign to the network site. To enter VLAN and IP subnet information, click Insert row, click the field under VLAN or IP subnet, depending on what you want to configure, and then enter a VLAN, an IP subnet, or a subnet/VLAN pair. You can insert multiple rows. If you have System Center 2012 SP1 or System Center 2012 R2 and you previously selected the option for private VLANs, also enter the SecondaryVLAN for each VLAN that you enter. For guidelines for configuring network sites, see “Network sites” in Configuring Logical Networking in VMM Overview. By default, if you leave the VLAN field empty, VMM assigns a VLAN of 0. This indicates to VMM not to use VLANs. In trunk mode, VLAN 0 indicates native VLAN. For example, add the IP subnet/VLAN pair that makes up the example BACKEND network in Seattle, as shown in the following table. In your test environment, make sure that you use VLANs and IP subnets that are available in your network. 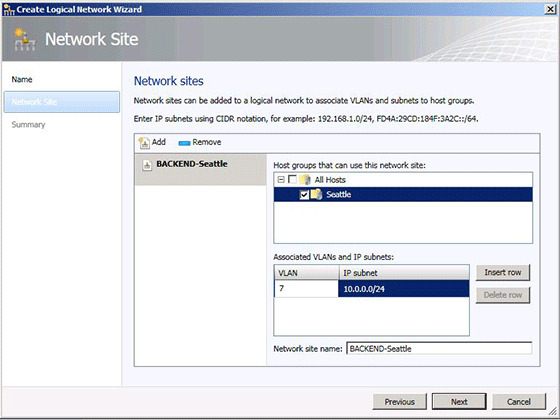 Optionally, create additional network sites by clicking Add and repeating the process. For example, create a network site for the BACKEND logical network that is named BACKEND – New York, and assign it to the New York host group. Add the example IP subnet/VLAN pair that makes up the BACKEND network in New York. Throughout the example scenarios, the BACKEND logical network is used as an example. Therefore, example IP subnets and VLANs are provided only for the BACKEND logical network. When you complete this step, click Next. The Jobs dialog box appears. Make sure the job has a status of Completed, and then close the dialog box. Verify that the logical network appears in the Logical Networks and IP Pools pane. Also, if you added network sites, right-click the logical network, click Properties, click the Network Site tab, and verify that the intended network sites appear on the tab.